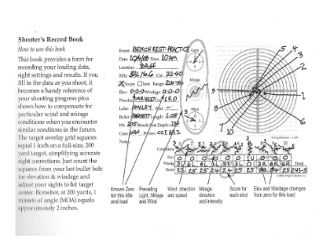 The Record Book is spiral bound so that it lays flat on the bench, and is done on heavy stock paper. It is 5.5"x 8" and has 60 pages. The Target Pad, which is the same German Ring target as in the Record Book, is extremely handy when one is actually shooting the match for keeping track of shots or marking cross-fires. It has a grid overlay that represents one inch on the 200-yard German Ring target, which helps in calculating elevation and wind changes. Schuetzenmeisters need a Target Pad in their pocket when running the line to keep track of the inevitable mistakes made during the match. Several of these Target Pads need to be in your shooting box-they are 4.25" x 5.5" and are 50 pages to the pad. Recording your shots as you fire can really save the day when it comes to a match - and the person who makes the fewest mistakes generally wins.